If you eventually speak with travelers who’ve seen Marmaris, you’ll get to learn only one complaint towards it. It provides too many choices and most of the visitors feel baffled to make a decision about where to begin. However, you don’t have to worry about that. We are here to help you to get the best of Marmaris. Marmaris salutes its visitors with a smiling face and generously offers so many things to do. If you are here in Marmaris to spend your vacation for a limited time, probably determining the activities to do and places to go before you actually initiate your holiday may be a good idea in order to utilise your days. That’s why we tried to provide you with some tips & recommendations about how you can have a better holiday in Marmaris and give you some advices in many aspects from what you can do to where you can eat… You can also prefer living spontaneously and pop-in to places you see while you are passing nearby. This article may also help you to make up your mind while you are rambling around and searching for an attraction. Regardless of whether you go to Marmaris for a month or a week, your exploration has to begin at the beach. Indeed, Marmaris is famous for its beaches. You’ll be able to go with getting a tan or walking along the long beach. There are lots of pubs, restaurants and bars. You are going to absolutely adore the atmosphere and simply relax. Essentially, if you’re one of such people that don’t wish to stick to any plans while on a trip, Marmaris is well suited for you as well. Just spend your time sampling the local delicacies, taking naps or reading at the beach. Besides being well known for its outstanding beaches, Marmaris is also home to numerous little villages and neighborhoods that you could explore and spend time watching fishermen. You should undoubtedly enjoy a meal cooked by the natives by the beach. Nevertheless, we strongly encourage you to go past the seaside and truly discover Marmaris. If shorelines interest you, we recommend going to Icmeler. The Icmeler Beach isn’t just stunning, but it also is a great place to fish. You may also take part in alternative water sports if you’d prefer a different experience. A stroll through the Icmeler Shore will be all you need to replenish yourself. Pamukkale is located near the ruins of the Hierapolis City. Bright stalactites have formed breathtaking castles, sinks and pools. Pamukkale appears to be a fairy land in which the sinks are located adhering to the ridge. A warm and calming bath inside the thermal waters in Pamukkale is an essential experience. If the past captivates you, you ought to spend quite some time to discover the Ancient City of Ephesus, which used to be well-known as a Roman City in Ancient times. You are going to really love seeing the House of Virgin Mary as well as the Temple of Artemis, which is referred to as one of the seven wonders of the ancient world. The beauty of Marmaris is that you could explore all of the close by places by going on daily excursions. Boat trips offer you amazing possibilities to discover the waters and enjoy the marine life from extremely close quarters. Regardless of being a sea lover or searching for some peace or even excitements, we strongly recommend you to spare at least one of your days in Marmaris and go on a boat trip. 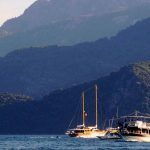 Different types of boat trips are available in Marmaris in order to meet with demands and satisfy every single holidaymaker. The only important thing here is, do you enjoy being in a boat and floating on the sea? If yes, we guarantee you that the rest could be shaped as per your preferences. From all day-all inclusive boat tours where you can see hidden bays of Marmaris to half day fishing tours where you can improve your fishing skills alongside take a break and swim in different seas, Marmaris boat trips are waiting for you. If boat trips awaken your interest but can’t decide which one to choose, may we invite you to our excursions section where you can see further information about each type of these trips? If you’re one of those people who always vote for sea food for dinner or lunch, don’t leave Marmaris without tasting some fresh fish or other marine products in TurgutReis Fish Restaurant. A huge bowl of green leaves accompanied with vegetables of season will fit perfect to your main dish. We hope you enjoy your meal as much as we do, Bon appetit! The newly constructed bicycle lane of Marmaris with 5,5 km length allows people to bike around safely and without facing with traffic. Bike rental shops in every single corner will catch your eye at very first glance. Please keep in mind that getting quotes from two or three places is advisable to make a comparison and make a good decision. Have fun! As being local Marmaris lovers, we must say that it is almost impossible to discover every single corner of Marmaris! For instance, have you ever had a chance to look through Marmaris from the top of the hill located at the end of Icmeler region? Have you even heard of it? No worries, no need to climb the hill to catch this view, you can simply reach the spot by any vehicle, even on foot. Here is your route: follow the road towards Icmeler direction starting from Marmaris city centre first, once you come to the end of Icmeler, you will see a path sweeping upwards. Following this path, you will encounter with this breathtaking view in a 3-minute-drive. If you fancy enjoying some perfect waterscape accompanied with every tone of blue and green, that’s the place you’re looking for. Let us give you a quick advice: when the sun starts to sinks after a good long day, rally your beloved ones, grab cold drinks for each and enjoy the sunset at this unique spot. That may even be your every day routine while you’re in Marmaris. Cheers! When you start to get to know Turkey, you will see that every city has its own grand bazaar! That’s because of the great interest of the foreign tourists alongside the locals’ needs. Some may find it strange but Turkish people doesn’t ony sees that it’s normal but also necessary! Once you are in Marmaris, don’t miss out to pop in to Grand Bazaar which is located in the central area where you can easily get access. If you ever had chance to see the Grand Bazaar in İstanbul, we can only imagine how impressed you are. And if you haven’t yet to see there, we guess you have heard some of it and still wondering. So here is a chance for you to visit a huge market like a smaller version of the one in İstanbul. Make sure that you have enough in your pocket hence you’d like to buy everything you see! One of the things definitely worth to see when you’re around is this unique waterfall can be deemed as a wonder of Marmaris. Do you like the calming effect of the sound coming from waterfalls with a combination of perfect view full of numerous colours of green? If you’re nodding your head to say yes right now, then well, that’s obviously the place that you shouldn’t miss out before leaving Marmaris. You can reach the waterfall area with a 45-minutes’ drive. Take our advice and do something good for your soul, you will be thankful! Would you like to see some visual fist during your daily walk in the central area of Marmaris? We can truly say that you should see the fountain display at least once in your vacation. The fountains are lit up every day during the spring/summer season but honestly the best time for the show is evening time. Watching the moves of amazing waters while dancing to the music with the colourful lights will be great for the whole family. Also keep in mind that the attraction is completely free of charge which means everyone can take a look while walking around the city centre. Hope you will enjoy! Marmaris is among the most visited destinations on earth during Summer. It was described by Heredot “The place having the best sky in the whole universe”. It is situated in Turkey behind the hills of Aegean area. The bar street in Marmaris contains contain a number of very commendable clubs and discos. If you like going out during the night, you should try visiting these areas situated in Marmaris, like the bars offering a variety of music genres and drinks. These clubs also make the nightlife in Marmaris very memorable and enjoyable for the clubbers. CCCP – A famous bar that welcomes anyone above 18 years and offers great services like music and drinks all through the night. Joy Club – This is the nightclub for those interested in having unlimited fun with very well picked quality vibes. B-52 – This is a perfect place to sip on different cocktails prepared by bartenders who are extended while dancing till the morning. Backstreet Disco – It has a seating area located in the balcony and bamboo furniture that is designed uniquely. They serve music (first class) to the visitors from night till morning. Greenhouse Club – This dance club has great service and various types of music, parties, night shows and DJs. Rock bar Marmaris – This bar has special events and parties often and is mainly for the lovers of rock music. The above-mentioned clubs are the heart of Marmaris nightlife and make it very memorable and many people always want to come back. Marmaris Castle is one of the most important historical spots you can visit in Marmaris, Turkey. It is estimated that The Castle in Marmaris dates back to 3000 BC, but it was rebuilt in 1522 by Ottoman Sultan Suleyman. There is a small museum included in the castle to people enjoy their visit while looking through some ancient artefacts. The Castle lost an important part during World War one because of the French forces. It was however restored in 1983. In 1991, Castle Museum in Marmaris was opened. The Marmaris Castle Museum exhibits amphorae, tombstones, figurines, oil lamps and other discoveries from surrounding archaeological sites, including from Knidos and Datça. The castle location offers stunning views of the sea and the town below. When you visit the castle, your trip will not be over till you have taken a hike up the hill which is not a very hard thing to do. The castle itself has an eye captivating architecture and a person can stumble upon some amazing and fun facts. The visit fee is 5 Lira per person and it takes under an hour to go through the whole castle. It is a great place to take some photos, and have a snack at the nearby café. This fascinating historical landmark has been a keystone relic, aging all the way back to the late second century A.D. Scientists have discovered that the cave acted as a sacred worshiping area for the habitats of the Marmaris, Turkey. Rituals and religious practices were held here by the people, in honor of the Gods; in particular Goddess Leto, who was the mother of the God Apollo. Rock formations towering around thirty meters high; in the shape of a semi-circle, give tourists a sense of awe in respect to the cultural perspectives the people of Marimaris, and what it was like to live there many years ago. Being located at the highest point of the island this landmark is a must see for any person wishing to visit Turkey. With breathtaking views, and a connection to the historical past of the culture of Turkey; this cave is a sight to see for anyone who enjoys to travel during their holiday. Are you interested in history, war or prophets? If so, The Sariana Mausoleum in Marmaris is the place for you. A fortune teller who lived during the 16th century, Sariana (also called the “Blonde Mother”) was widely regarded as a gifted oracle. In fact, her talents were so highly regarded, it is rumored that Suleiman the Magnificent visited her seeking wisdom before his struggle against the Crusaders at Rhodes. Her vision of victory for the Ottoman armies is said to have encouraged the leader to undergo the successful campaign which banished the Christians to Malta. Located in the northeast region of the town, the Marmaris Sariana Mausoleum is built in the style of traditional Ottoman architecture. As an addition to the tomb, a mosque has recently been constructed adjoining the buildings. After visiting the Mausoleum, there are other fun attractions and things to do for tourists in the area. These include a seafront promenade, plenty of places for dining and drinking, as well as accommodations such as hotels and a holiday villa. Local custom has it that by visiting the Sariana Mausoleum in Marmaris today, you can still soak up the wisdom of the prophetess. So what are you waiting for? It’s time to make your fortune! The beautiful city of Marmaris has lots to offer from its famous beaches, ancient architecture and famous bars and restaurants. However, one experience you should not afford to miss out when in town are the Marmaris Turkish Baths. This tradition was made popular by the Sultans and has been in existence for hundreds of years. Thus it is considered one of the most important aspects of Turkish culture. Marmaris Turkish Baths are perfect for the start of your vacation as it will leave your body feeling fresh, rejuvenated and relaxed. Furthermore, the bath offers additional health benefits such as getting rid of dirt and toxins in your skin, improving overall blood circulation and relieving the body from stress. Most Turkish baths rooms in Marmaris are warm and lined with marble sitting wash basins. They come with running cold and hot water which can be mixed to suit your comfort. At the center of the Turkish bath, there is an elevated hot marble platform. This platform can be used for laying, sitting or working up a sweat. At the Turkish bath, you will also find a masseuse. The role of the masseuse is to provide you with a body scrub and massage. The scrub will entail the use of coarse loofa soil which will assist to remove the dead layers of skin revealing soft supple skin. The massage will include aromatherapy oils and scents which will soothe the body while providing you with relaxation. The whole experience should take no more than 2 hours, and all you need to carry is swim gear. It is recommended to take the Turkish bath at the beginning of your vacation because it will leave you rejuvenated for the activities ahead. This bath will guarantee long-lasting freshness that you will not regret. Marmaris in Turkey is one of the most popular beach destinations in the world and usually crowded with tourists from across the globe. There are plenty of things to do in Marmaris that can really be fun and entertaining to people of all ages. One of the things that you can really have fun with is water sports in Marmaris. Most beaches here offer you plenty of thrilling water sports. that you can experience. The urban beach, long beach, and Icmeler beach are some of the places where you can find these sporting activities. Beaches in Marmaris offer parasailing, pedalos, jet skiing, scuba diving, etc. There are many water and dolphin parks where you can spend some quality time with your family too. The beaches here are crowded with wonderful yachts and various other boats that you can use to sail. You can enjoy those beautiful little trips to paradise island and enjoy breathtaking views of the serene and majestic sea. You can even enjoy some fun rides like the banana boat, sea cycling, canoe, and paragliding as well. You are guided here by trained experts for scuba diving and other water sports adventures. The beaches here are unlike anything else in the world and you are sure to have a great time here. There’s a lot of things to do in Marmaris, Turkey that it can be hard to choose which ones to do first. From restaurant hopping to exploring historical ruins, Marmaris has it all. But the greatest thing to do here is to visit its divine beaches. Marmaris has a lot of beautiful, sandy beaches lining up its shores that you can go explore to your heart’s content. Icmeler Beach is a scenic holiday paradise that greatly embodies what it is to have some amazing Mediterranean fun. If you’re into some crazy awesome nightlife, this beach’s shore is lined up with a lot of fantastic bars. But if you want some quiet and relaxation, this is also a great spot for fishing. And if you’re looking for something a bit more daring and a lot more wet, Icmeler is a good place to do some scuba diving. In all honesty, the whole of Marmaris is a great place for scuba diving. You can pick from a whopping fifty two different diving sites, and begin exploring the vast, clear waters of this beautiful paradise while enjoying a diverse array of marine life that lives on the Mediterranean Sea. There are a great many scuba diving schools to go to, and they’re always open for scuba divers of any experience. So, if you’re new to the sport, don’t worry. Trusted scuba instructors will be there to teach and help you. If you’re in Marmaris for only a short period of time, it really is a heartfelt recommendation to try scuba diving here. You’ll surprised and mesmerized by the other-worldly experience the Marmaris waters have to offer! Hisarönü is a charming village, smaller than Marmaris but equally as vibrant. Tours often visit here, as it is well-connected with Marmaris. It has a decent nightlife too, if you would like a change of scene! Another frequent trip for any Marmaris holidaymaker is Turunç, a scenic coastal village 20km away. Despite the recent burst of tourism, somehow this quant fishing community has managed to retain its Turkish authenticity. In addition, the azure bay provides a great backdrop for photos! If you’re keen on appreciating nature, then you must visit Kumlubuk. There are many well-trodden paths, perfect for hikers looking to take in the mountainous terrain. The food is great here too, with many renowned fish restaurants dotted throughout the town. Unlike Marmaris, it remains more untouched by the tourism industry – an added bonus. Orhaniye also provides its own unique sights. Aside from the variety of water sports on offer, the waters here are shallow, making for a relaxing day out by the sea. Cappadocia one of the best places of Turkey. Every year millons of tourists go there. If you come to Marmaris, you have a chance to go to Cappadocia. We organize a tour to Cappadocia once a week. You can explore the Cappadocia region and taste world famous fine there. For more information please contact us. miss. Honestly, there is nothing quite a good, modern, contemporary and unconventional Marmaris Yacht Marina. Now, this is a certain indicator of a good time. The oldest marina in the region has welcomed guests from all around the world, all leaving with almost a heartbreak and promising to come back. Plus, you’ll get to experience luxurious lifestyle first-hand, with extravagant yachts parked all over the place, carrying visitors who come to worship this hidden Turkish delight. Sink in some fine dining and awake your taste buds, by offering them a variety of locally prepared and inspired foods, exploding with different spices and aromas. And who can miss out on those unforgettable sunset moments? There are multiple reasons why this is the greatest absolute thrill of all. First off, you will get to take a dip in the open Mediterranean surrounded by secluded beaches and reefs no one ever visits on foot. Aside from this, the mile-long beaches are set to knock you out of the park with the party sounds echoing from nearby bars. Sunbathing and tanning will never look as good as in the bright open sun. Followed by sweet sounds of summer hits, the Marmaris Yacht Marina can promise you a good time. With the ability to cater to over 1000, the Marina lives up to its reputation- gigantic, effective, and outstanding. Never worry about the commodity over here- the Marina guarantees you a heliport, consecutive security and cleaning services during 24 hours. Aside from this, you can always hop into the local beach bar, restaurant, pub or cafeteria. For the more restless, the Marmaris Yacht Marina provides a grand health and sports center, as well as a free car park and library. Pamper yourselves with a good massage, or get a new cut at the resident hairstylist- there is nothing these hosts haven’t thought of. Those who prefer to shop can pay a visit to the local supermarket and technical stores in the area. Truly, this is a lifetime experience you will keep talking for years to come. In the world of tourism, good service means the world to customers -when you are treated like a VIP, you feel like it. Therefore, do not hesitate to join thousands of travelers in this once-in-a-lifetime adventure. With all such things to do in Marmaris, Turkey, you won’t ever recognize just how time flies in Marmaris. When you depart, you will do so with a pledge to return once more.